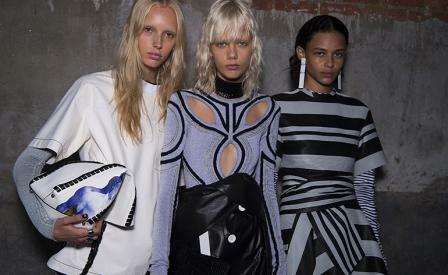 Mood board: If one word could define Proenza Schouler’s S/S 2017 show it would be colour. The bold use of colour was prevalent throughout, in vivid prints, abstract colour blocking and in the images used on oversized t-shirts and long-sleeved shirts. Finishing touches: Is ear make-up a thing? Jack McCollough and Lazaro Hernandez decided to complete the show’s beauty look by colouring some of the model’s ears, which also sported large dangling earrings. Several looks had strategic cutouts, while others were finished with a dose of fringe. Best in show: The show’s opening look, a matching black and white pleated crepe top and skirt, was almost sculptural in form, and perfectly composed. Bold colour-blocked stripes, especially on a knit dress felt like wearable abstract art.